Choosing the right HVAC company to repair, maintain or install your heating or cooling system is incredibly important. The quality of your chosen contractor’s workmanship will have a big impact on the lifespan and performance of your HVAC system. If they make mistakes, then your system won’t last as long as it should and it won’t heat or cool your home efficiently. 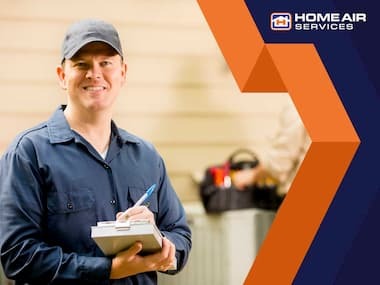 Home Air Services is one of the leading home heating companies in our area thanks to our many years of experience and our meticulous, highly trained team. You can rely on us for your HVAC projects. Here’s an overview of our services. We are a Lennox Premier Dealer™, which means we can offer you the best possible Lennox HVAC products for your home and we have access to the latest industry training and tools. Our technicians are NATE®-certified, so they have extensive knowledge on properly designing and sizing HVAC systems. We offer all sorts of systems, so we are confident that we have the right heating or cooling option for your budget and needs. We can perform preventative maintenance on your HVAC system to keep it running at peak efficiency all-year round. As one of the top HVAC and duct cleaning companies in our area, we are well-versed in keeping our customers’ heating and cooling systems problem-free. Investing in one of our maintenance programs can save you considerable money on repairs. You’ll also have peace of mind knowing that your HVAC system is in good condition. We can also help our customers with their HVAC emergencies. We have an emergency service duty technician on call on evenings and weekends, and we don’t charge for travel or overtime. Our technicians can deal with any kind of HVAC problem. They will quickly and accurately identify the problem and perform the necessary repairs. Our air conditioner maintenance service can make you cooling system perform more efficiently and last as long as possible. We can also assist you with emergency repairs, full system replacement, duct cleaning and more. Our technicians are certified and they have many years of experience working on all types of homes. There’s a reason we’ve stayed in business since 1953. Call us at (301) 585-8100 to learn more about our services and products or to ask for a free estimate.